The Rutherford B. Hayes Presidential Dollar represented the third release of the year and the nineteenth release overall for the series honoring the former Presidents of the United States of America in the order served. Prior to becoming President, Rutherford Hayes had fought in the American Civil War, where he was wounded five times and acquired a reputation for bravery in combat. He would be elected to the House of Representatives by a wide majority and also serve as the governor of Ohio for three terms. He would be elected 19th President of the United States by the Electoral College, even though he lost the popular vote. He announced in advance that he only intended to serve a single term. 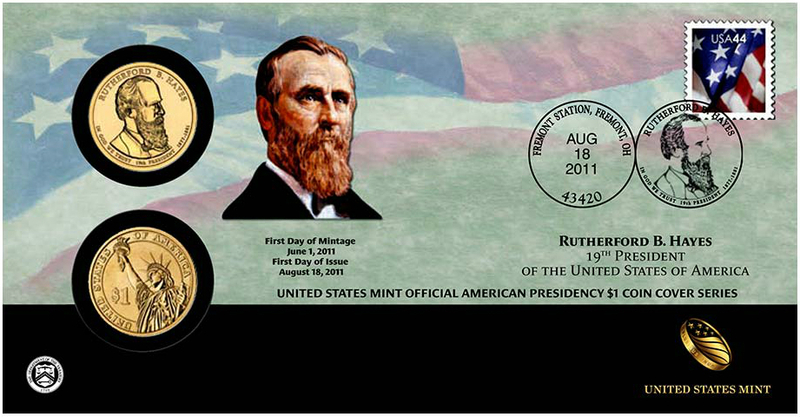 The obverse of the Rutherford B. Hayes Dollar featured his portrait as designed and sculpted by Don Everhart. Surrounding the portrait were inscriptions indicating his name, the motto “In God We Trust”, “19th President”, and the years of the term “1877-1881″. On the reverse of the coin carried a depiction of the Statue of Liberty, also designed by Everhart. Inscriptions included “United States of America” and “$1″. The edge of the coin include the motto “E Pluribus Unum”, the date, and the mint mark in incused edge lettering. The circulation release date for the coins was August 18, 2011, with the official launch ceremony held the same day at the Rutherford B. Hayes Presidential Center in Fremont, Ohio. Attendees included Thomas J. Culberson, the executive director of the Center, and Marc Landry, Acting Associate Director of Manufacturing at the United States Mint. 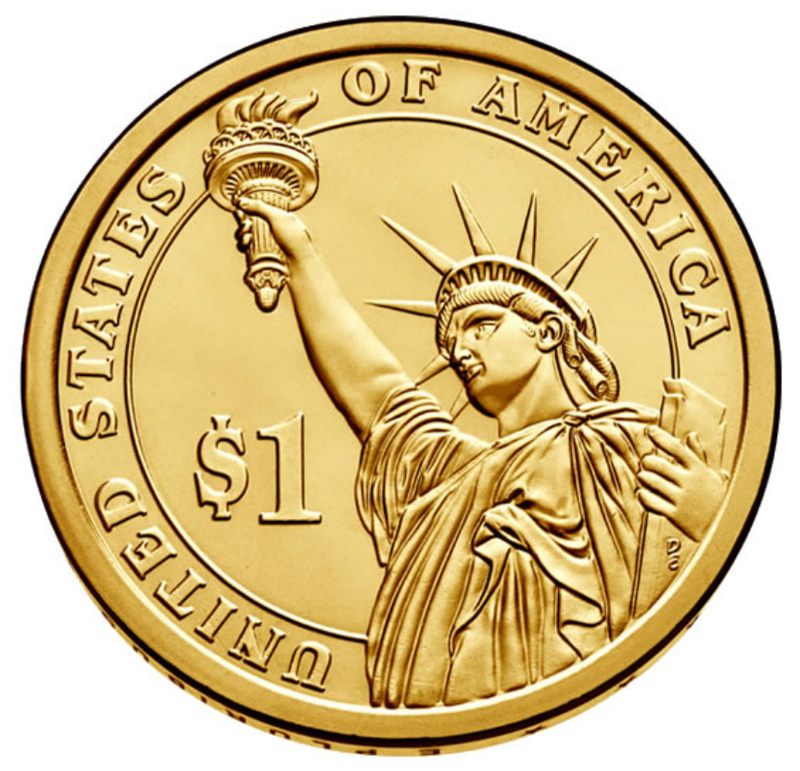 Members of the public who attended the ceremony were given the opportunity to exchange currency for rolls of the new dollar coins. Production for circulation consisted of 37,660,000 coins struck at the Philadelphia Mint and 36,820,000 coins struck at the Denver Mint. 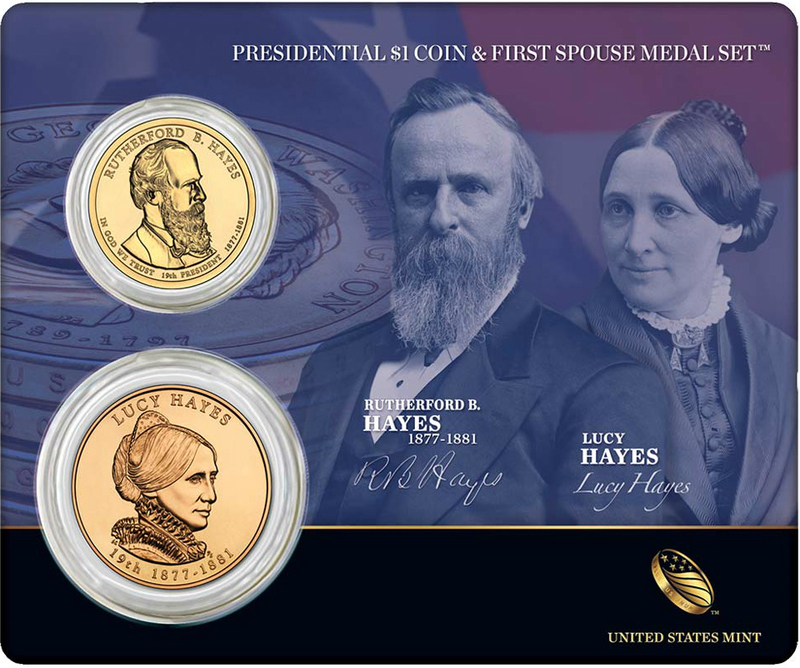 Besides the circulation release, the Rutherford B. Hayes Dollars were also available in certain numismatic products such as the 2011 Mint Set, 2011 Proof Set, 2011 Silver Proof Set, and the two 2011 Presidential Dollar annual coin sets. 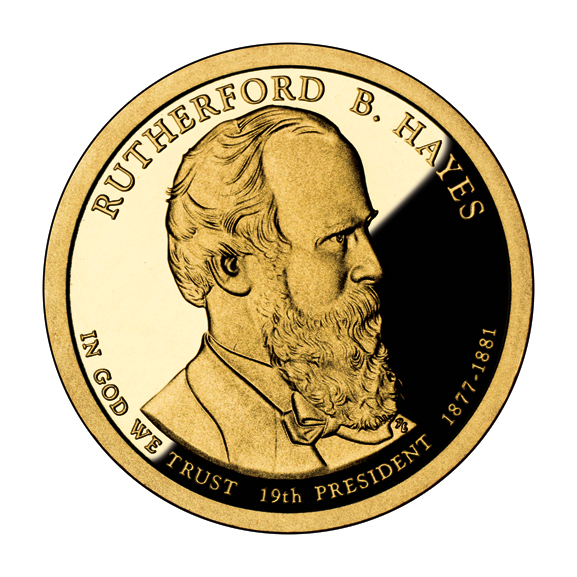 Hayes believed in meritocratic government, equal treatment without regard to race, and improvement through education. He ordered federal troops to crush the Great Railroad Strike of 1877. He implemented modest civil service reforms that laid the groundwork for further reform in the 1880s and 1890s. 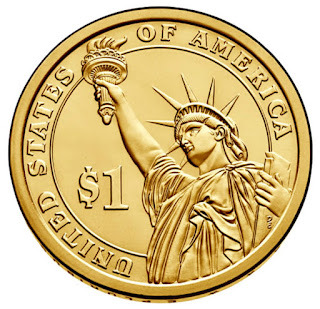 He vetoed the Bland–Allison Act, which would have put silver money into circulation and raised prices, insisting that maintenance of the gold standard was essential to economic recovery. His policy toward Western Indians anticipated the assimilationist program of the Dawes Act of 1887. Hayes kept his pledge not to run for re-election, retired to his home in Ohio, and became an advocate of social and educational reform. Biographer Ari Hoogenboom says his greatest achievement was to restore popular faith in the presidency and to reverse the deterioration of executive power that had set in after Abraham Lincoln's death. Although supporters have praised his commitment to civil service reform and defense of civil rights, Hayes is generally listed among the bottom half in historians' rankings of U.S. presidents.